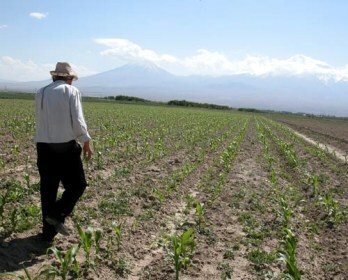 The Mission, Vision and Core Values of Farm Credit Armenia reflect the commitment of the board of directors, management and staff to developing agricultural production, supporting its infrastructure in rural Armenia through a sustainable cooperative financial institution and providing credit in good times and bad times. Mission Statement: Our mission is to improve the quality of life in rural Armenia by providing accessible financial services to agriculture; agribusiness; small and medium enterprises, micro-borrowers; young, beginning, and small (YBS) farmers; women; and minority rural residents. Vision Statement: Our vision is to be the leader in agricultural credit investments among credit organizations in Armenia by offering preferable services to our customers thus fostering the development of rural Armenia. Farm Credit Armenia’s logo expresses the organization’s cooperative structure. The basis of the organization (a pyramid) is rural Armenia with the board of directors and management on the top. The cooperative is in the middle, in the shape of a basket, which expresses the idea of sufficiency and transparency. The pyramid is a symbol of sustainability and power.